The amusement parks in the Gold Coast area are open all year round, meaning that one risks the occasional maintenance closure when visiting outside of peak season. in the run up to our trip we checked the park web sites and determined that we'd be missing out on two coasters in the area; one each at Sea World and Warner Bros. 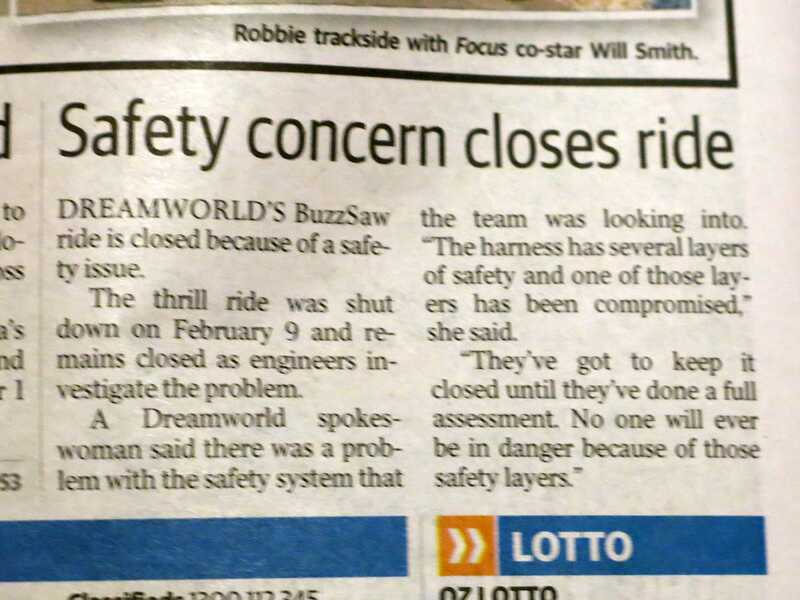 However, it looked like we'd dodged the proverbial bullet at Dreamworld. Unfortunately, that changed on February 9th when Buzzsaw went down abruptly for unscheduled maintenance. The initial reopening date suggested that we'd still have a chance of riding if we changed the order of our trip, but it was subsequently postponed several times. An article in the Gold Coast Bulletin revealed the cause to be a safety concern. When the ride finally reopened on March 28th the train had been retrofitted with seat belts. Dreamworld has been through some major changes in recent years, centered around the attractions for families and children. The old Nickelodeon Central area was debranded into a generic Kid's World area in 2011, only to go under the knife again a few months later as part of a deal with Dreamworks Animation. The result is three distinctive themed areas; Madagascar Madness, Shrek's Faire Faire Away, and Kung Fu Panda: Land of Awesomeness; and all look fantastic. The attention to detail is clear to see, with themed buildings, photo points, and heavily customised ride hardware. We began our visit by meeting up with Gavin and James, and the four of us headed to the Giant Drop, recently displaced as the world's tallest drop ride after holding the record for fourteen years (and yes, my prediction was wrong). That being said, the Intamin ride built in 1998 is still enormous, and it seems unlikely that even the most astute passengers would notice the thirty-eight foot difference between first and third place when that additional height represents less than half a second of falling. The experience today was just as good as I'd remembered, even down to the dramatic slowdown for the last few feet of climb that gives riders time to enjoy the spectacular view. The drop produced a stomach-in-mouth feeling that lasted about one second, followed by several seconds of freefall and a smooth landing. The fastest roller coaster in Australia (in theory at least) was relaunched (pun intended) with a backwards-facing car in September 2010, some six months before its better-known cousin in the United States. Tower of Terror II now has a tunnel that covers almost the complete horizontal length of the track, and the resulting wind effect combined with chasing lights to make the ride feel much faster than it actually was. The experience was thrilling, though less than it might have been as the car was only reaching the half way point on the tower, in sharp contrast to a few years ago. That said, the ageing hardware seemed to be having a bad day today; we rode quite a few times, and on more than one occasion we got to hear the pre-recorded three, two, one, go without moving at all. It is worth passing comment briefly on the design of the ride station, or more specifically its exit. Disembarking passengers walk down a short ramp before entering a small, claustrophobic, and rickety lift which descends roughly two floors into a gift shop over a period of about twenty seconds. I'm given to understand that the ride entrance originally used similar lifts but that they were replaced with stairs for reasons of efficiency; why this wasn't done on the exit also is anyone's guess. The family coaster formerly known as Rugrats Runaway Reptar (and subsequently Sky Rocket) is now Escape from Madagascar. The train was clattering a bit today, but it didn't cause any head banging, which is about as much as one can say for an older generation Vekoma ride with over-the-shoulder restraints. We ended up doing a second lap so that Megan could take a photograph of a rather entertaining sign that she noticed in the queue area; the related questionable joke will no doubt appear in her trip report at some point. 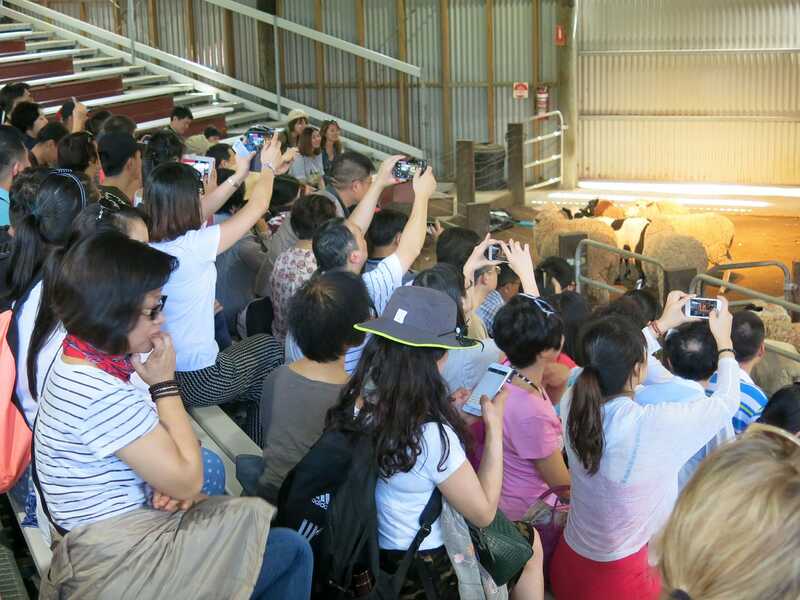 We walked past fifty shades of grey kangaroo (and other assorted wildlife) on the way to the Australian Sheep Shearing Show. My slightly crazy girlfriend may have been looking forward to this more than anything else in the entire continent of Australia, given the number of times it came up in conversation in the weeks before our trip. I was somewhat less convinced; as the presenter commented, pick any sheep, they're all pretty much the same. Readers are encouraged to mentally pronounce this observation in a strong Australian accent for maximum effect. Be that as it may, I'll admit to a certain amount of curiosity about how the act of depilating a sheep could possibly be stretched to an entire show. As it turned out, this wasn't tried; instead, the performance began with a completely unrelated series of short acts; a blind-folded volunteer holding a leaf in her mouth which was cut using a whip, a dog stealing a ladies purse, and an owl flying around the set. Only after these came the main activity, during which a single animal was stripped of an impressive amount of wool. After the first few seconds I switched my attention to watching the overexcited reactions of the predominantly Asian audience; it seemed that everyone needed to have their own footage. We had to wait about twenty minutes to board Mick Doohan's Motocoaster, which after almost eight years remains the only example of a motorbike coaster built by Intamin. The lack of additional installations is hardly surprising given an uncomfortable seating position and a layout that is, in a word, boring. Worse yet, the train has developed an unpleasant rattle over the years, to the point that once was enough. Our next stop was at the trackless dark ride that every enthusiast should suffer through experience at least once during their lifetime. Big Red Car is a short ride through a number of different rooms featuring televisions with The Wiggles singing your favourite songs. Those who wish to can join in; all others are invited to go quietly insane. I'm not entirely sure how we got from a living room to an underwater scene to a garden full of roses, but I'm confident that any five-year-old Australian could explain the connections if asked. After a frighteningly expensive (and slow) lunch break we decided it was time to face Cyclone, the ageing ride from Arrow that was originally installed at Luna Park Sydney. The constraints of the original site resulted in an odd layout comprising lengthy straights, coat hanger turns, and two inversions at the very end of the course that were negotiated with no finesse whatsoever – but at the end of the day, it was still more fun than the motorbike! We took two more rides on the Giant Drop before heading to the Model T Vintage Cars, one of the few attractions remaining at the park from its opening season in December 1981. The original track was extended and subsequently relocated to a new location at the pack of the park in 2007, but the model vehicles were left unchanged and still run using tiny petrol engines akin to what one might find on a lawnmower. We particularly enjoyed the placard inside each vehicle giving important instructions for operation, namely Push Accelerator Pedal And Hold It Down With Foot. I'm not at all sure that we'd have worked this out without help. Gavin wanted to ride the Dreamworld Express, a diesel train that replaced the park's two steam locomotives in 2013. This ride now operates on thirty minute intervals with lengthy pauses at each station, and as a result isn't all that useful as a transportation mechanism. We ended up disembarking after two stations when we realised that it would be quicker to walk to our target, Tower of Terror II, where four more laps took us to park closing time. We were walking through the Dreamworks area on our way out when we noticed that guests were still boarding Pandamonium, a beautifully themed Zamperla Air Race, and it seemed like it would be rude not to join them. The park has two separate queues for this attraction, alternating between full-height and half-height swings, and we caught it in the latter mode. The motion didn't do a whole lot for me one way or another, though I obviously wasn't seeing what the machine could really do.